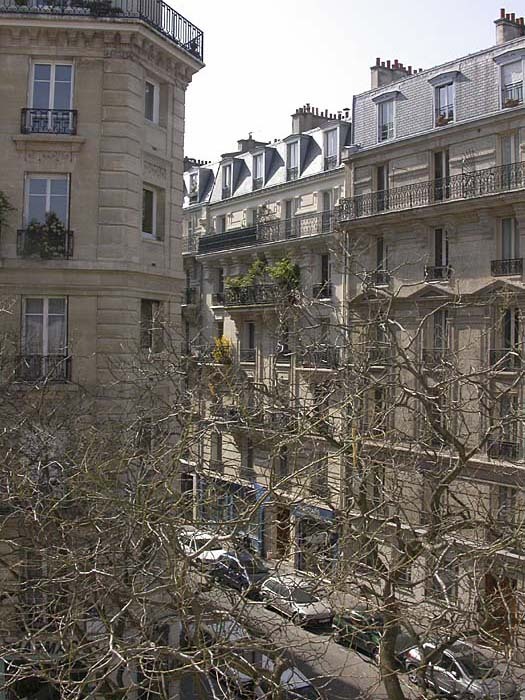 Our apartment in Paris--fifth floor of 18, Avenue René Coty, and just below my old homebase in Montparnasse--was rented via the internet, and recommended by friends. Though small, it provided a kitchen that allowed us to have a break from restaurants, and walking-around-room in a kitchen, full bath, dining room, living room, and bedroom. All windows looked out on interior courtyards--sort of the standard "Rear Window" setup. The picture below was taken from the window of our March 31 hotel, the Hotel D'Alysia, located just 3 blocks from our apartment, where we stayed after turning in our first rental car, and before wheeling our luggage over to the apartment on April 1, 2003. F immediately stocked the kitchen with necessary staples, so that we could have all of our breakfasts and more than half of our dinners in our own space. We had to keep it simple (two burner stove, no oven, microwave, small refrigerator)--but F, accustomed to serious cooking in a sailboat galley, turned out memorable dinners using good French fresh produce and meats, and reproducing some of the dishes we'd found in our stay in the Dordogne region (the cooking there features lots of duck, goose, confits, creative uses of mushrooms and walnuts, lots of cream, and offbeat meats such as duck and goose gizzards, pigs' feet, tripe, and so on.) We came back gizzard afficionados! Don't think of chicken giblets: rather the gizzards, preserved in duck fat, are slow-cooked in red wine sauce like a boeuf bourgignon, or sliced thin and served cold on salads, and they are DELICIOUS!) Then there were the steaks in wine sauce or green peppercorn cream sauce. And fish. And, MOSTLY, vegetables, since it seems to be very hard in many parts of France to be served vegetables in standard menus! There are all those gorgeous vegetables in the markets, but no Chinese or Vietnamese restaurant that we visited served any vegetable except black mushrooms and bamboo shoots! Similarly, brasseries and restaurants normally serve meats, soups, and salads, but rarely cooked vegetables. We caught up in our Paris kitchen! I needn't tell you that the coffee, breads, and cheeses were remarkably good, but it may be news to you that an excellent bottle of Muscadet can still be bought for $2.00 - $4.00 almost anywhere in France. And F developed an obsession with finding Vielle de Prune and Rocq de Noix liqueurs from the Dordogne. I'm four pounds heavier than when I left. F, more disciplined, gained no weight. Though it is no longer true that you can expect good restaurant food in any French establishment, if you are careful and choose places frequented by the locals and those that avoid "touristic" menus in English, and stay away from the horrible "Hippopatamus" chain, that tries to convince the French that they need a really bad version of American fastfood at upscale prices, you will still eat as well in France as in any country I know. Italy is, however, a contender. I have made no attempt in selecting photographs to label them or separate them into categories. I'll let the images speak for themselves, since everybody goes to Paris eventually, and the major landmarks are well-known. I will mention that for the first time in many trips to Paris, we did NOT go to all the major museums--no Louvre, no Pompidou Center (though there are many pictures here of the building itself), no Musée d'Orsay, no Rodin Museum, and so on. The exceptions were our visits to the Picasso museum, Ste. Chapelle, and Notre Dame cathedral. Rather, we went to several photography expositions in museums and galleries, walked by the Seine as one must, visited old haunts in Montparnasse, circumnavigated the Luxembourg Gardens, discovered the Montsouris park, sat in cafes, met friends for dinners, and drank a great number of bottles of good French wine. Most of the pictures are of the Parisians themselves--it has to be one of the world's greatest cities for people-watching--in cafés, the métro, on the street, by the Seine, in the parks, in love. Enjoy.